eBay SetMaximum Store Operated By satmaximum All CategoriesMenu Home All Categories Delivery Returns Terms About Us Contact Us TOSLINK PREMIUM Digital Audio Cable HD Quality Optical S/PDIF Product Description >> Wholesale inquiries please contact us << ATTENTION: Small plastic caps must be removed from the ends before insertion into an optical port on a digital device. 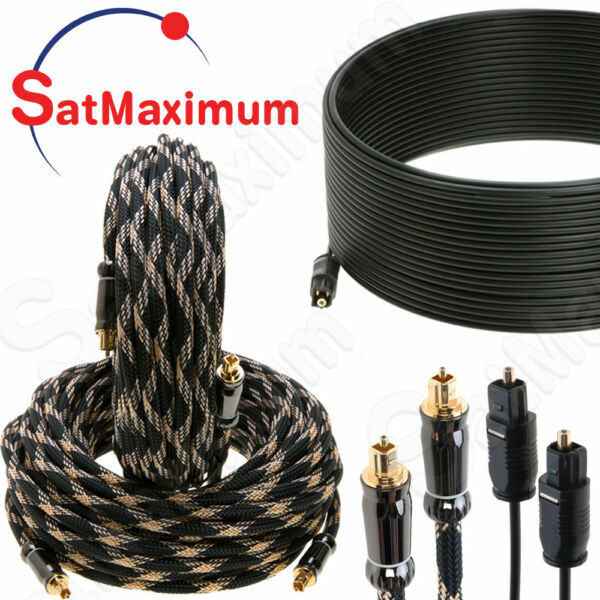 This SatMaximum premium Digital Optical Audio Cable is designed for the best quality sound transmission and provide perfect connection between your CD player, Blu-Ray player, satellite DVR, Sony Playstation, Xbox, or other device to your digital audio video receiver. The Sony/Philips Digital Interface Format ( S/PDIF ) provides accurate musical reproduction for a Digital Optical Audio signal, commonly referred to as Toslink. Toslink allows for the distribution of uncompressed 2-channel PCM audio or compressed multichannel audio, such as DTS® or Dolby® 5.1 or 7.1. Being an optical signal, Toslink is immune to problems that can plague electrical signals, such as crosstalk, magnetic interference, or radio frequency interference. This premium cable features a full-sized gold plated metal Toslink connectors and a mesh jacket. The mesh jacket helps protect the cable from nicks, cuts, and kinks, which could cause damage to the internal optical polymer fiber. Specifications: Full-sized male Digital Optical Audio (Toslink) connectors. Mesh jacket protects cable from nicks, cuts and kinks (Only for PREMIUM). Gold plated ferrule resists corrosion and provides maximum protection for the connector tip. Precision polished fiber tips for maximum signal transfer. 8.0mm outside diameter. LightSpeed Highest Performance audio signal transferring. All SatMaximum cables made from a new material (never from recycled)! Payment We accept all major credit cards and other electronic payment methods through PayPal. We only ship to Confirmed PayPal Addresses. Sales Tax: For shipments to New York addresses we are required by State law to collect 8.625% sales tax to your item and handling. Delivery Free Shipping to the continental USA. Working Hours: Monday through Friday 9am - 5.30pm. Delivery within 2-5 business days. Tracking numbers will be sent to the email address that is associated with your paypal account. Canada shipping 7-10 business days using UPS. Buyers outside the US are responsible for any applicable import duty and local taxes. Please verify with your customs before purchase. All orders placed before 11am PST ( 2pm EST ) time will be processed and shipped within the same business day. Returns 60-Day money back guarantee. The original receipt or a record of the purchase is REQUIRED on all returns. Return products must also be in its original condition. Including box, UPC bar code, packaging and all other accessories. S&H is non-refundable.